I am always looking to mounting side skirts. Usually it means that the stage of never-ending alternating between the airbrush and X-acto knife is over and what is left to do is the joy of painting and weathering. The process of mounting the side skirts was bit more complicated than it seemed at first, though in large part it was just because I did not look carefully at the instruction. The side skirts are made of 4 panels which fit together quite easily and there are 4 support struts that attach them to the hull side. I have assembled all these together with the exception of the rear-most skirt (parts T4 and T3) before mounting the whole piece to the hull. There are also few hexagonal nuts on top of the front skirts (again, their placement on the left and right set of side skirts is asymmetrical), these are in the kit represented with tiny photoetch pieces, which I have replaced with styrene nuts punched using my punch-and-die set for more realistic thickness. The rear section of the skirts was mounted as the last step. I had a bit of a hard time having them aligned at the two ends, where they attach to the mid-section of the skirts and rear of the hull and had to thin them a bit from the inside. The left side fit is quite fine, on the right one they are not perfectly align, as can be seen from the photos. 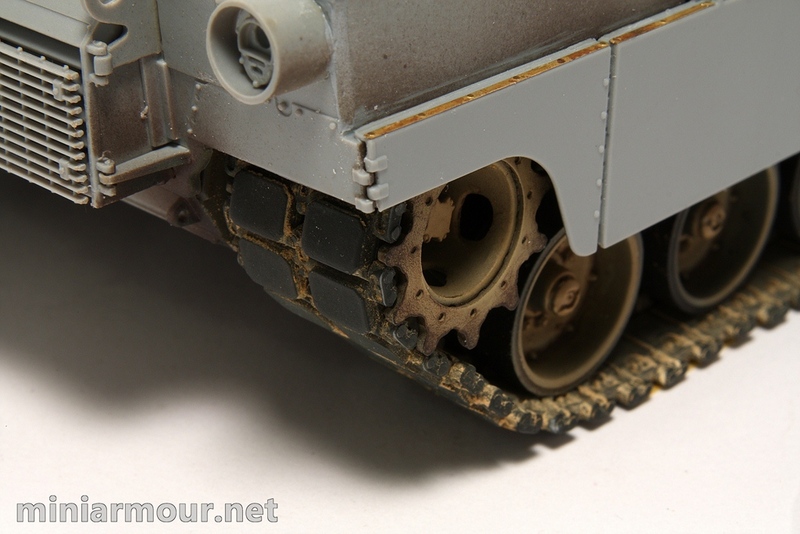 I realize with models you need to attach the skirts somehow, but those top bolts and strip merely hold flimsy rubber pieces to act as some sort of seal between the skirt and the hull. I wish you would somehow put the pins in the skirts along the top, with their spring cotter keys. awesome job with the end cap on the front fender spring, just like we had, to beat those damn pins out! clearly you have the advantage against me, as I have only seen Abrams on the pictures so far… Sounds, you have served in it, if I’m not mistaken (?) Thanks for your praise, I’m glad you like my model.